Members of the Wyss Institute were at New York City’s Hammerstein Ballroom last night to collect the 2012 Webby Award in the category of Science — and to deliver one of the Webby’s hallmark, five-word acceptance speeches. The Webby Awards, which recognize more than 100 categories of online excellence, are widely considered the Internet’s highest honor. Almost as celebrated as the awards themselves, are their extraordinarily compact acceptance speeches, some of which were pretaped and played during the evening’s gala event. 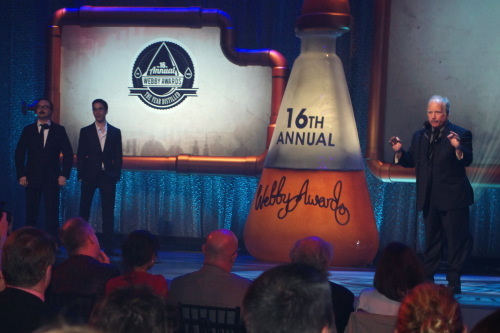 Ayis Antoniou, Mary Tolikas, Don Ingber, Rick Groleau, and Jermaine Reid represented the Wyss at the 2012 Webby Awards. The Wyss’ “When Nature calls, we listen,” which was delivered by Founding Director Donald Ingber, is available for viewing at http://wbby.co/ex. Patton Oswald hosted the event, which was broadcast live on HD and included performances by Passion Pit and the Key of Awesome. Among the special achievement awards were Bjork as Artist of the Year, Louis C. K. as Person of the Year, and Instagram founders Kevin Systrom and Mike Krieger as Breakout of the Year. Also making appearances were New York City mayor Michael Bloomberg, Spike Lee, Jeremy Lin, and Richard Dreyfuss. Following the awards ceremony, the winners were invited to party at a reception and dinner at the Edison Ballroom where they were treated to live performances by Q Tip and Action Bronson. Joining Ingber were Director of Operations, Mary Tolikas; Administrative Director, Ayis Antoniou; Manager of Web Communications, Rick Groleau; and Manager of Events, Jermaine Reid. The Wyss’ winning website combines a bold color palette, striking imagery, and innovative content in capturing the collaborative culture and translational work of the Wyss community. Among its many multimedia features are animations, videos, and interactive activities, such as building virtual nanostructures using DNA origami and understanding how the human lung-on-a-chip technology works using a 3D-rendered animation.